During this week, Lincoln Memorial University’s MBA students in MBA 595 will analyze top corporate organizations. Within two decades of the initial store opening, Whole Foods Market has evolved into the world’s largest retail chain of natural and organic foods supermarkets with over 299 stores in North America and the United Kingdom. The success and rapid growth of Whole Foods Market is due to their core belief in differentiating their products from the competition by being highly selective about what they sell, a dedication to high quality standards, and a commitment to sustainability for people and our planet. They have completed many acquisitions that have fueled this rapid growth, most notably Wild Oats Market, that somewhat reduced competition initially. However, competition has increased significantly in recent years, and Whole Foods is now using their market dominance to attempt to maintain control. Whole Foods Market has also weather controversy involving their aggressive monopolization of the organic foods niche, their anti-Union stance, and statements made by the CEO that have been regarded as unethical. Also, Whole Foods has continued to build and acquire stores, resulting in earnings slowing that has led to an accumulation of long-term and short-term debt. 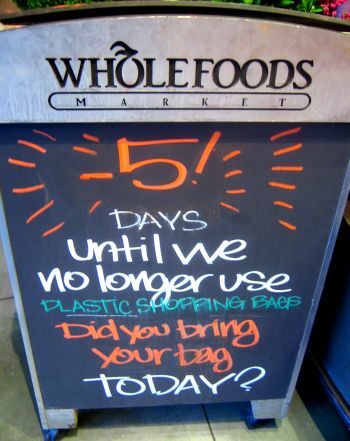 It is presumed for this reason that Whole Foods placed a moratorium on new store openings. I really enjoyed learning about a company I had never really heard of. The whole foods and organic foods market is at an all time high. More health conscious individuals are looking for stores that offer good quality products that have few preservatives and are fresh. Any company that stands out in a positive way amongst other similar organizations normally has a good chance of doing well in their respective markets. In the markets we shop in today, people are looking for the socially responsible companies purchase items from. Gamble and Thompson state, “Whole Foods Market’s social responsibility strategy in almost every segment of its company value chain and is a big part of its differentiation strategy” (p. 206). This is one of the biggest reasons that Whole Foods Market is successful and will continue to be successful as long as they keep evolving their marketing strategies over time. Gamble, J. E., & Thompson, A. A. (2011). Essentials of strategic management: The quest for competitive advantage. New York, NY: McGraw-Hill/Irwin. I really liked this presentation. I’ve been to a few Whole Foods Markets, and I’ve always been impressed by the selection of foods that they offer. The foods they offer just seem to be fresher, which I guess I true, because they have strict selection methods for the foods they sell. While there isn’t a Whole Foods Market anywhere around where I live, they have managed to expand and do very well despite selling foods that aren’t necessarily main stream (Gamble and Thompson, p.251). I agree that they should focus more on the stores they have, but without expansion, they won’t be able to grow into new areas where some people have never heard of them. They need to find a good balance between expansion growing the quality of what they already have. I also enjoy learning about Whole Foods, their natural and organic foods, commitment to sustainability and quality standard differentiate themselves from the competitors. However, consumers are still struggling with the recession and sometimes they may choose others options that better fit their budget. Thus, I agree with group B, Whole Foods need to focus on advertising where they can emphasize their values and believes for a better Earth. But most importantly, they need to lower their price in order to become more competitive and keep customer attention. For a company to do a more cost-efficient job managing its value chain than rivals, managers must launch a concerted, ongoing effort to ferret out cost-saving opportunities in every part of the value chain (Gamble, Thompson Jr., 2011, p. 99). I really enjoyed learning about Whole Foods. I agree with Zach points that Whole Foods needs to find a good balance between expanding and maintaining what they currently have. Companies you can find this balance will better position themselves for sustainable growth. Rapid expansion can often leave companies with low cash reserves and can threaten their ability to respond to market issues. This was evident in the Starbucks business model. Starbucks goal was to have a coffee shop on every corner in large metropolitan areas. Such rapid expansion caused significant cash flow issues, when the financial crisis of 2008 hit it left Starbucks scrambling to find ways to cut cost, ultimately leading to the closure of thousands of stores due to the lack of cash reserves. Therefore, Whole Foods needs to ensure that they have sufficient resources to supports itself without spreading itself too thin before adopting a rapid expansion business model. I really enjoyed watching your video. I didn’t realize that Whole Foods was expanding to the extent that was measured. In this economy, it doesn’t seem like this is such a good idea. You mentioned this in your presentation. They need to focus on the stores they currently have open. According to Thompson (2008), “From 2002 to 2006, Whole Foods’ management decided to drive growth by opening 10-15 decidedly bigger stores in metropolitan areas each year…” (p 251). In 2009, Whole Foods reduced the planned new store openings, but that was not without cost. In 2009 and 2010, Whole foods was able to “terminate the leases for 13 of its planned new store openings at a cost of $5.5 million” (p.269). Maybe with an economy shift, they will be able to resume store openings. The presentation was excellent in my opinion. Although I had never heard about Whole Foods Market, I can now see why they have such a strong presence in the whole foods arena. By studying business, we have learned that a successful corporation becomes so by satisfying consumer’s needs with high quality products. Whole Foods Market has certainly done this very well by offering some of the freshest and most organic food products at reasonable prices and at very well stocked and organized stores. Still, I think that most their success stems from their corporate core values, “Our deepest purpose as an organization is helping support the health, well-being, and healing of both people(customers and team members) and of the planet(sustainable agriculture, organic production, and environmental sensitivity) (Gamble and Thompson, 2011, p.251). When employees as well customers adopt the belief that by offering and purchasing products from Whole Foods Market they are contributing to the well being of their bodies as well as that of the planet, a paradigm shift takes place where customer loyalty results. Excellent post Miguel, I can’t agree more. Additionally, this was good work. As a regular customer of Whole Foods I can say from experience that you feel as though you are getting better quality products and a wider selection of food products compared to Walmart or Kroger. I feel that customers genuinely feel the high prices are correlated with the quality of products offered and stocking esoteric, ethnic, and organic products that the big chains don’t. I think this is in alignment with what Gamble says and you recognized, as supporting the health, well-being, and healing of the people and planet. If you haven’t been to Whole Foods, there is one on Poplar in Memphis if you want to check it out. I am new to Whole Foods Market; prior to reading about them in this presentation I have never heard about them. One thing that specifically stood out to me about Whole Foods Market is the strategy that they use. There strategy is a strategy based on differentiation but more specifically I believe it is a focused differentiation strategy. Thompson and Gamble state that focused differentiation strategies “are keyed to offering carefully designed products or services to appeal to the unique preferences and needs of a narrow well defined group of buyers” (p. 108). This strategy has been successful for them and they should continue to use it. I have personally enjoyed shopping at Whole Foods Market. It is an experience as well as it was a delight, finding foods that I can’t find in regular grocery stores. However, the rapid expansion strategy is one that Blockbuster used “Founded in Dallas in 1985….reaching a peak of 9,094 stores by 2004” and which eventually broke their backs and weakend their market share. Organizations have to pay close attention to their investments in the brick and mortar growth and continually look at other means to offer value to their customers. One way of doing this is by greater promotion of the American Farmers by directly buying food and products from the farms in their regions. Whole Foods has had a really good thing going and they should evaluate their shareholder demands more closely as they continuously tweak their strategy to serve their consumers. I enjoyed the video and although I was excited to hear about a Whole Foods coming to this area, I am even more so since watching this video. Edwards indicates in his book “The Sustainability Revolution” that there are seven challenges in the Asilomar Declaration and one of them being “inspire the public to value safe and healthy food” (Edwards, 2005). With a store solely dedicated to this and in a more influential part of town, the location of the store may itself be an advertisement. Earth Fare has opened the doors with its contemporary and Generation XY focus, so hopefully Whole Foods will have that same feel and impact upon the shopper. Although it focuses on what is good for you, sometimes the experience for the shopper is almost just as important. Edwards, A. R. (2005). The Sustainability Revolution portrait of a paradigm shift. Canada: New Society Publishers.